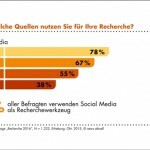 News aktuell, a subsidiary of German press agency DPA, has conducted an in-depth survey among more than 1,200 German journalists. They asked them about how, when, and where they do their research. 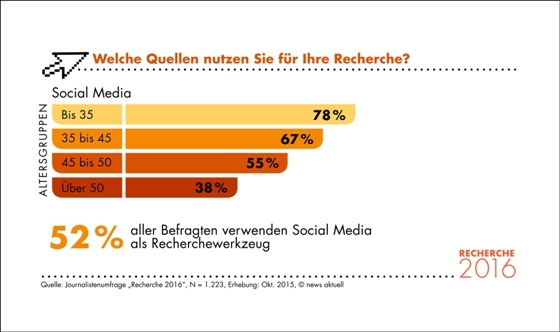 The name of the survey is Recherche 2016 (in German only). Younger journalists are already making intensive use of social media. Only the age group of beyond 50 years is a reluctant user. The chart is in German only, but you will get it. It shows which percentage of respondents within the age groups up to 35, 35-45, 45-50, beyond 50 uses social media as a source of information for their research. We can see that there is a generation of journalists, that uses social media almost as intensely as search engines. That reminds me that YouTube is said to be the “second largest search engine of the world”. It is especially popular for how-to-videos, tutorials, product explanations as well as talks and speeches for all sorts of topics (take the popular TED-Talks as an example). Amazon is named as another important search engine. Their huge online shop offers an extremely wide choice of products, prices from several vendors, customer reviews and appropriate accessories all in one place. Why should I research a particular product on Google? You may like this development or not. The fact remains, however, that it will not stop. For the time being, younger generations are still heavier social media users than the older ones. The younger ones won’t give up their habits as they grow older. Instead, we can expect overall social media usage rates to grow even further. Hence, if you are thinking about how your offers can be found on the Internet, you shouldn’t focus on the obvious search engines too much. Instead of tickling the last bit of SEO, might be better off investing your resources in a variety of channels. Our world in a search engine?